Take a look people, these frauds and liars won´t be able to hide much longer, we will expose them all. Stop lying about Michael Jackson´s Soul and spread Misinformation on me, his Twin Soul and what we do here, this is our Privacy and our Soul´s Rights. They try EVERYTHING to cover up the truth about Michael Jackson, the beautiful and innocent truth. They try to focus abusive behaviour and defamation, lies on his family now and loved Ones. Posted in ***NEWS***, Defeating Darkness- HEAL THE WORLD ©, IsIs- Susan Elsa-Archeia Faith ©, MADE IN HEAVEN: A "Living" Project (Cartoon & More), Michael & Susan: Resurrecting the MYSTERY SCHOOLS ©, ORIGINAL DESIGNS MYSTERY GARDEN ©, Osiris Un Nefer - Michael Jackson- Archangel Michael ©, THE TWIN EYES: INTERACTIVE VIRTUAL COMMUNITY 2012... ©, TWIN EYE Mystery Schools: MAGIC CORNER, Twin Soul Sciences ©, Uncategorized. Here comes another hidden secret in plain sight, inside of Michael Jackson´s work. Before we go into this, take a close look at this Book excerpt from my twin soul book – Archangel Michael´s Wedding, and all the claims of the past life in ancient Egypt. I am so shocked over this, but in a good way! First and only personal Video Message by Susan Elsa: The real Person behind the Works, Music, Cartoons and Books. Some Information on Projects, Secret Art Moves, Business Partnerships being formed and of course, Michael Jackson by Susan Elsa. Susan Elsa: Premonition about Elizabeth Taylor Death and Assistance to her Soul with Michael Jackson © OFFICIAL BOOK CONTENT ARCHANGEL MICHAEL´S WEDDING! 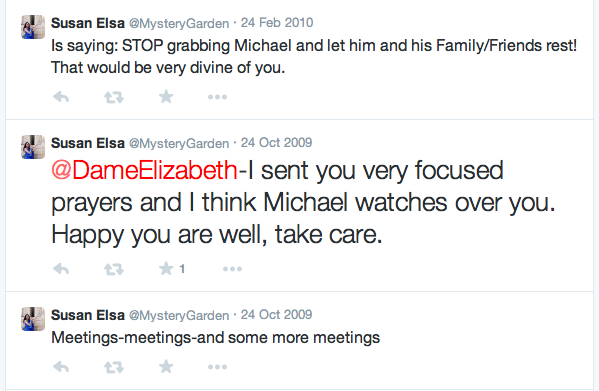 Before we move into the Book Excerpt, let me show you the only Messages I ever twittered to any Celebrity- Elizabeth Taylor after Michael Jackson passed. I kept with Michael sending her prayers and love, light for healing, to stay strong. It broke her heart, when Michael passed. I put a tweet to her, publicly dated, after she passed to focus ascension and healing energies for her. The power of the word. I saw her posting about Egypitan Robes of Kardashian before her Passing too, she always loved the Egyptian stuff, just like her buddy Mike. I will always love you and am thankful for eternity, that you could be there for Michael whenever I could not. You are a true Angel, Elizabeth. I am writing to you as a fellow Human Being, for support on protecting Michael Jackson´s Soul, my Twin. This is also important for me and my Survival, I do not want to end up like Michael, not able to sleep and tortured by jealousy and lies. Thank you, MJ´s Soldiers of Love for putting this Video up, more People need to remember his Words! The real life baby steps of my Music Genre “Spiritual Pop 777”, the magical Pop Music Concept. Magic is Part of my Soul. I remember how connected I felt to Merlin at this Age, and I thought my zodiac sign is UNICORN. No joke. The Spiritual is MY LIFE.